Preparation Methods & Dosage :Blue cohosh can be prepared as a tea or a tincture. The brew is dark, bitter, but a powerful remedy for the woes of menopause, arthritis pain. 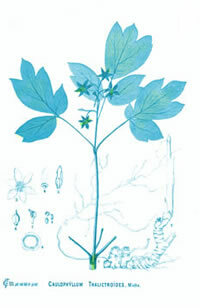 Blue cohosh extract is widely available in capsule form. Blue Cohosh Side Effects: Because of its strong uterine stimulant properties, blue cohosh should not be used at any time during pregnancy, except in the last week, under the supervision of a qualified herbal specialist. 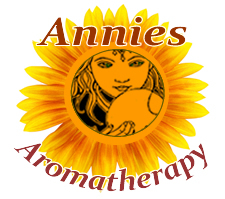 It can cause premature uterine contractions leading to miscarriage and/or abortion. The seeds are poisonous. Flowers:Inflorescence a loose raceme or panicle ; peduncle arising from the base of the upper leaf; flowers purplish' or yellowish-green. Fruit: The berries are mawkish, insipid, and without special flavor. The seeds are said to resemble coffee when roasted. 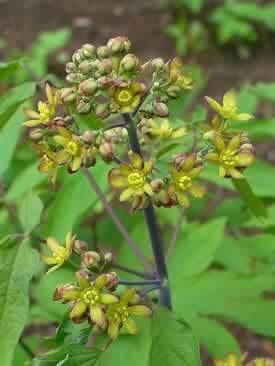 Blue Cohosh Snakeroot - - Caulophyllum thalictroides is on the United Plant Savers "At Risk" list. Wildcraft this plant responsibly and consider growing it if you have suitable garden space. Moist, shady, forest like soils. There is hardly an American remedy in our Materia medica that needs and probably merits a more thorough proving, upon females especially than Caulphyllum, and the sooner it is done, the better able will we be to cope with many of our most obstinate uterine cases.